Broadway Week began last week! Get two-for-one tickets to your favorite shows, from Chicago to Wicked. NYC Restaurant Week began this week on Monday. Metropolitan Museum of Art (through Feb. 12). The art world has been agog about this exhibition for sometime. One critic after another exclaims that it is the “Exhibition of a lifetime!” The hype has been over the top. Usually that means you’ll be disappointed when you actually experience it, because it couldn’t possibly live up to the hype. Not this time. This is a huge and marvelous exhibition that shows the evolution of Michelangelo from a young artist to a mature, divine genius. An exhibition that you will remember for sometime. Even the works of other artists that are included for contrast and context are amazing. Here are a few reviews from the critics to give you a fuller flavor of this exhibition. They strongly encourage you to make the time to see this “once in a lifetime” exhibition. I also encourage you to see it. Only 18 days left, because the exhibition closes February 12, and that last week it will probably be crazy packed. Erwin Redl’s Whiteout, a newly commissioned public art project, will light up in Madison Square Park. It consists of hundreds of transparent white spheres, each embedded with a white LED light, and suspended from a square grid of steel poles. The swaying sequence of light will be on display until April 2018. Jimmy’s Corner is right in the heart of Times Square, but you won’t find it on the corner, it’s mid-block. 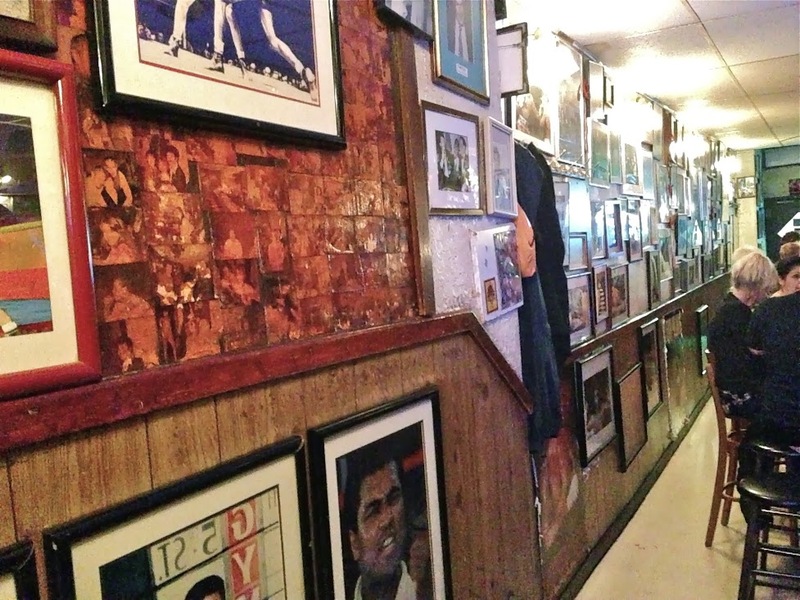 Enter this long narrow bar and you are struck by the walls covered with mostly black-and-white boxing photographs, and memorabilia. Soon enough you learn that “Corner” refers to proprietor Jimmy Glenn’s long career as a corner man for some of boxing greats – Liston, Tyson, even “the greatest,” Ali. Jimmy’s is a sort of time machine, taking you back to a time and place that no longer exists. All around you Times Square has cleaned up, grown up, assumed a new identity. Jimmy’s probably hasn’t changed a bit since it first opened in 1971. Certainly the bar itself looks original and the prices haven’t changed much either. When I brought a friend, who owns her own bar, she was surprised when she got the small tab for a round of drinks. Figured there must be a mistake, that maybe they forgot to charge for all the drinks. Times Square today is filled with neon glitz and wandering tourists from Dubuque, but not Jimmy’s. You’ll likely find some old timer’s at the bar nursing their drinks, some younger locals at tables in the back, and maybe a few adventuresome tourists clutching their trusty guidebooks. There’s no food served here because this is just a bar, and sometimes that’s all you need. On nights when no local team is playing, it’s a fine place to sip some drafts and listen to a great old time jukebox, with a great selection of 40s& 50s R&B and soul. On sports nights this very narrow bar can get a bit claustrophobic, filled with excited fans watching their team on the TVs. Either way, Jimmy’s is the place to be if you are looking for an old time bar in the new Times Square. Website: are you kidding ! This entry was posted in Uncategorized and tagged Benny Golson, City of Tomorrow Summit, Cloud Cult, Il Trovatore, Nilson Matta's Brazilian Voyage, NYC Events, Orfeh and Andy Karl: Legally Bound. Bookmark the permalink.